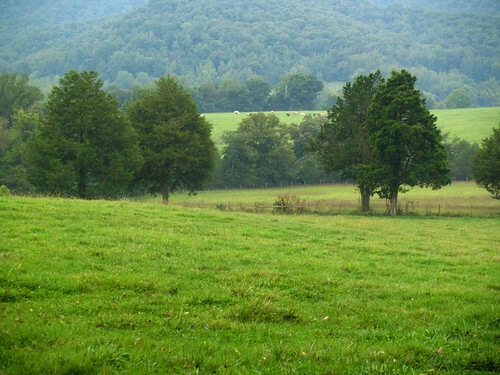 After leaving Kings River Falls, we drove off towards Boxley Valley. We had just been here a few weeks before, so neither Zack or I were really planning to stop (especially since we were looking forward to lunch at the Ozark Cafe). 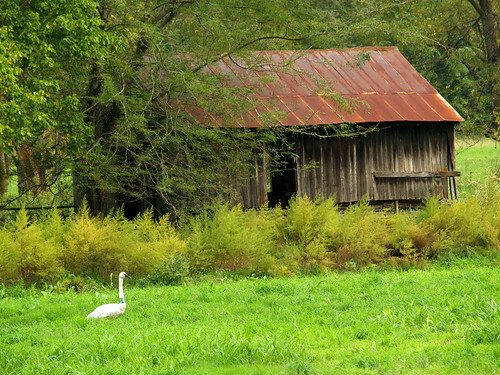 But we ended up stopping by this old barn, which just happened to have some of Boxley Valley's resident trumpeter swans strolling past. Zack pulled over to the side of the road, and I went to get my camera out from the backseat of his car. I thought to myself, "I wonder how long it'll be until someone else stops here to take pictures?" I was about to make that comment to Zack, until I turned around and saw that there was already someone else there taking pictures. We drove a bit further down the road, before stopping yet again. 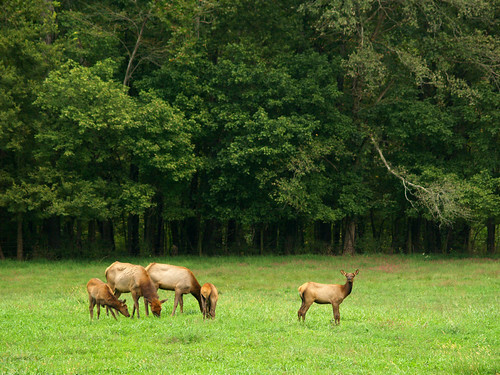 This time it was to get some shots of the elk that call Boxley home. 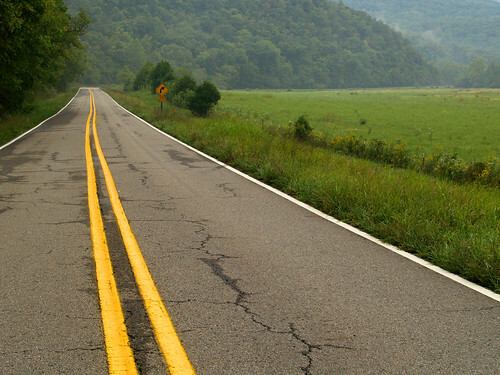 We quickly drove through the rest of Boxley, and headed towards Jasper. Once there we joined about thirty bikers for a nice lunch at the Ozark Cafe. The potato salad I had with my lunch was delicious, by the way. After a satisfying meal, we drove to the east along Hwy. 123. Our destination was Sam's Throne. 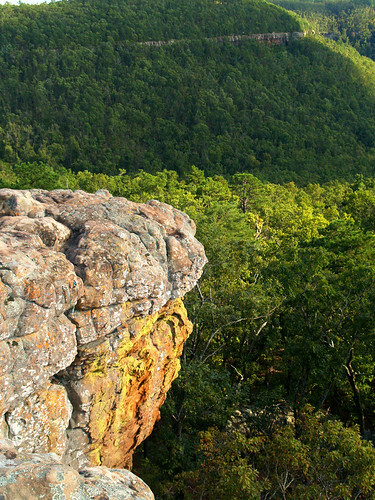 Located in the Ozark National Forest, Sam's Throne provides some dramatic views of the Ozark Mountains. It is also a hugely popular spot for mountain climbers as well. I think Zack's car was one of only two cars there with Arkansas plates, the rest were from out-of-towners. 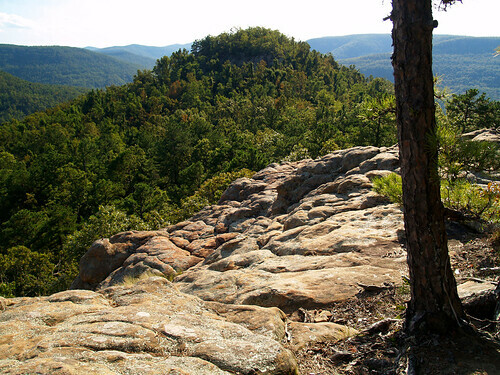 There are several climbing areas at Sam's Throne, all with names like "The Outback," "Northern Exposure," "Hero Maker," "Valley of the Blind" and "Deliverance." I know any attempt of rock climbing would result in a certain long and tragic fall, so I'll leave all that stuff to the pros. There are a few miles of trails at Sam's Throne, but we were short on time and only walked the short and level trail to the main overlook there. This shot was taken along the way there. Sam's Throne is actually named after someone named Sam. 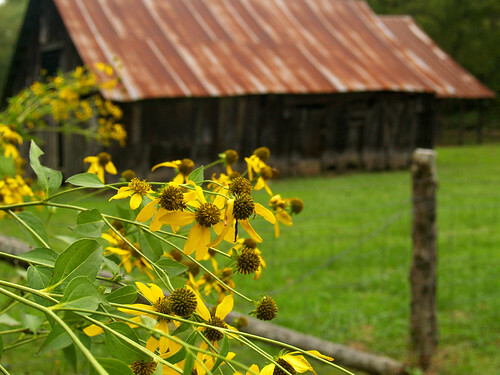 Back in the 1820s, there was a local man named Sam Davis. He claimed that his sister had been kidnapped by Indians, which made him a bit angry. He would then climb out onto the rocky outcrop and give fiery sermons to all of his neighbors within earshot (much to their displeasure, I'm sure). Legend also has it that Sam buried some gold on Sam's Throne. But people have been searching for it in the 160 years since then and not found anything (that we know of!). And the view looking towards Sam's Throne. I managed to lose the lens cap to my camera up there. So if you're ever at Sam's Throne and notice an Olympus lens cap lying on the ground, please let me know! So Saturday rolled around and another little photo trip was planned with Zack Andrews. 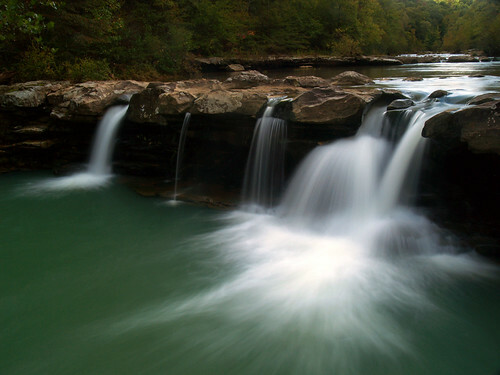 This trip we were going to head up to some more spots around the Buffalo River - Kings River Falls and Sam's Throne. I had been to Kings River Falls once before, last February. 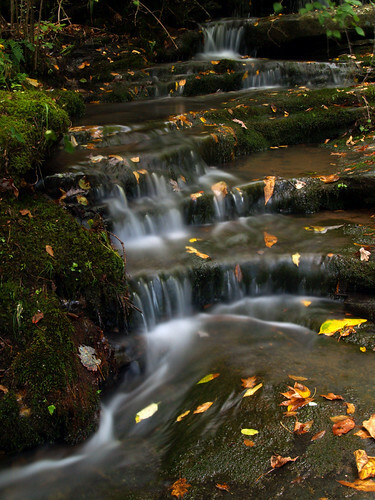 It is a beautiful little waterfall, so I was interested in going to get some more pictures of it. 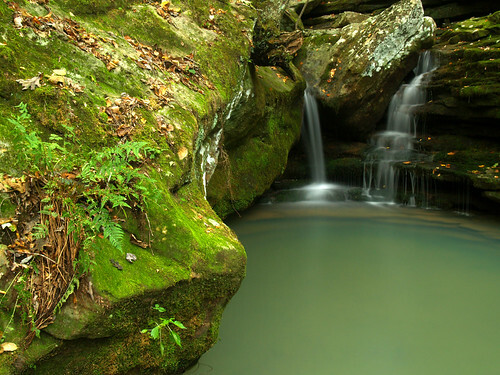 Kings River Falls is reached via some dirt roads up in the Ozark Mountains. The dirt roads were, thankfully, in good shape. 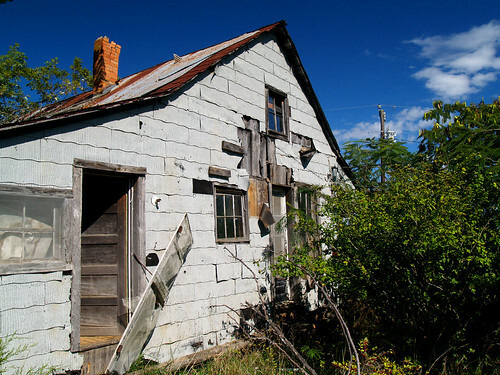 We ended up taking a different route to the falls than what I had taken earlier this year, and found several neat old barns along the way. 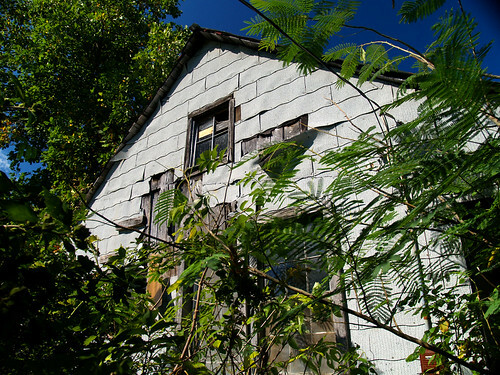 We stopped at one, and then was pleasantly surprised to see this cool abandoned house next to it. We walked inside the door here and had a quick look around. It seemed like the house had been home to a chicken coop recently, as evidenced by the large amount of chicken poo on the floor. We eventually made it to the trailhead to the falls, which is located right next to an old house and barn. 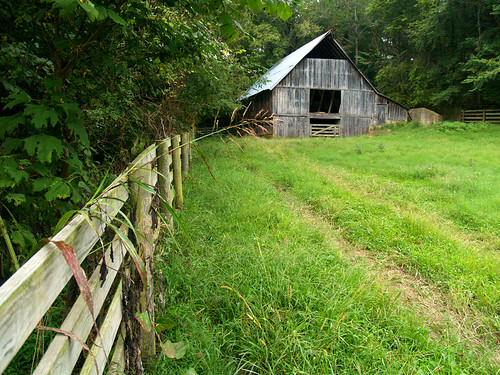 The trail runs through a gap between a small creek and a large field, overlooked by the old barn. 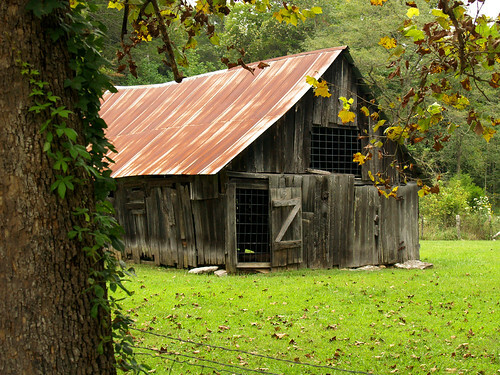 The poor barn has surely seen better days. Now it looks like a bomb had gone off inside it. It also reminded me of Back to the Future, where Marty goes back in time and messes up his parent's falling in love. The result is that his brother and sister start to fade out of the picture he carries with him. 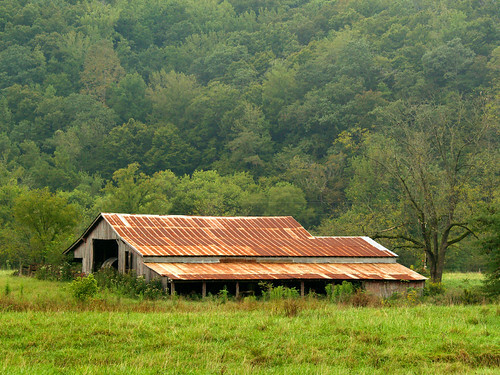 The barn looks like it's slowly fading away to nothing. Great Scot! The trail to the falls is short and easy. And before too long, you finally reach the 10-foot tall Kings River Falls. It was still way too bright for my pictures to turn out, but I tried my best. I had borrowed a set of ND filters from Zack, and used every single one. But still, not much luck. I also dropped down and got some pictures under the falls. It was shaded there from the sun, so I was able to get pictures without worrying about the light. 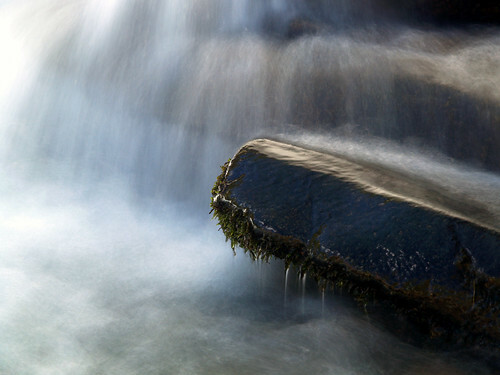 I saw this rock, with some moss hanging down from it, sitting under part of the falls. 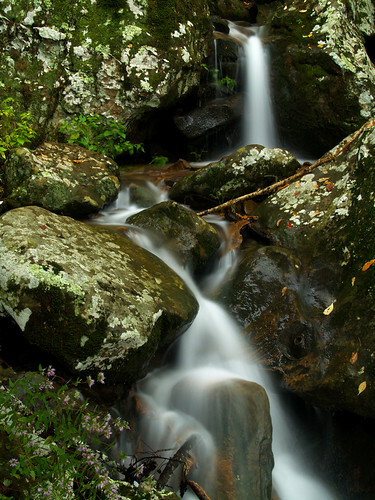 The small creek that flows into Kings River had some nice little waterfalls and cascades too. Here are some shots from there, which was helped slightly by the fact that it was harder for the sun to get past the trees here. It was here that I turned back around to get shots of Kings River Falls again. Zack had gone up further past here and found another cool waterfall. But after taking more pictures of Kings Falls, I eventually made my way up the hill, and was taking pictures of this little waterfall when Zack was walking back down the hill. It was getting late in the day, so we ended up leaving after that so we'd have enough time to get lunch and check out Sam's Throne. I'm annoyed with myself for not going to see the other waterfall there. Oh well. After all, it would have just been a different spot for me to stand while getting annoyed at the sun. 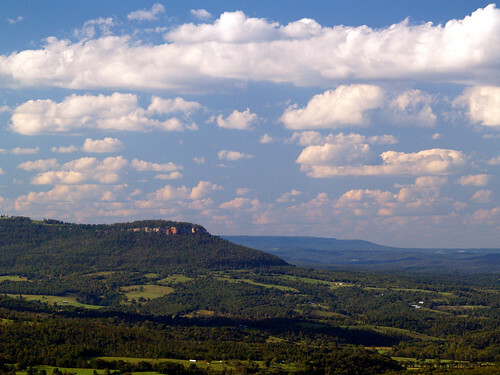 I meant to post this earlier, but here is a panoramic shot from Petit Jean Mountain. It's seven shots stitched together using Hug-in. 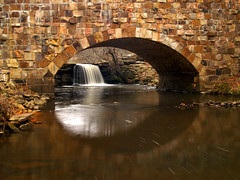 The view is of the small waterfall that shoots over the rock dam that creates Lake Bailey. 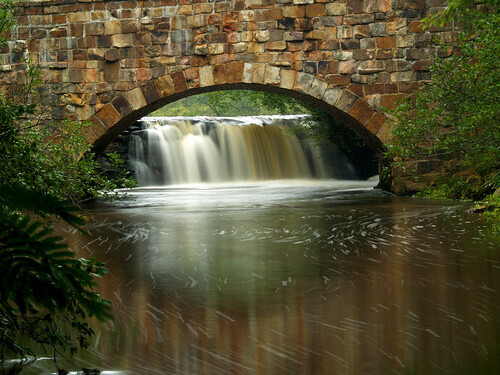 The creek runs over these falls and under the old Davies Bridge. 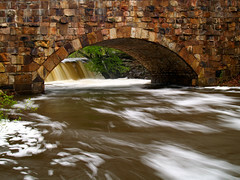 The bridge was built by the Civilian Conservation Corps in 1934. A larger view of this shot can be seen HERE. 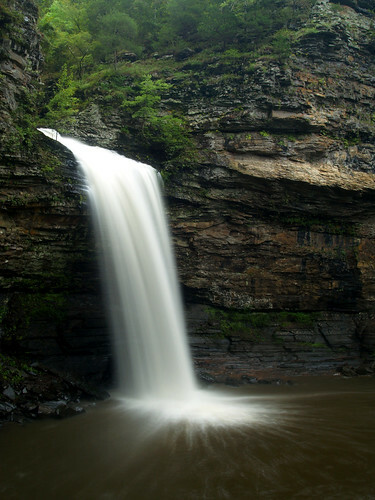 But the waterfalls at Petit Jean were awesome on Saturday. 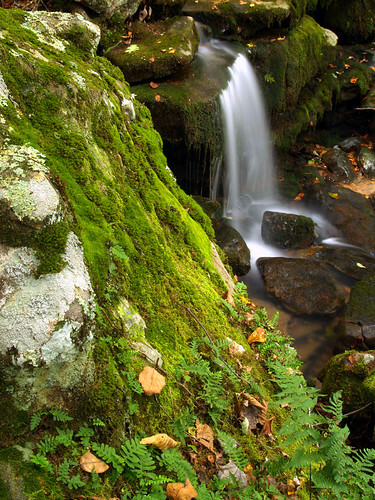 As the trail switchbacks down the hill, a small creek rushes and tumbles down some moss and lichen-covered boulders. With all the rain this past week, it was running unusually high. It's a neat little waterfall - like the appetizer for the upcoming main course of Cedar Falls. We finally made it to mighty 90 foot-tall Cedar Falls. I feared it would be really crowded there, but it wasn't too bad. I did have to wait a few minutes for some people to clear out to get this shot. There was a group of people who decided to walk out behind the falls and pose for some pictures. It wasn't too bad - they'd end up providing some nice perspective to show how tall the falls are. 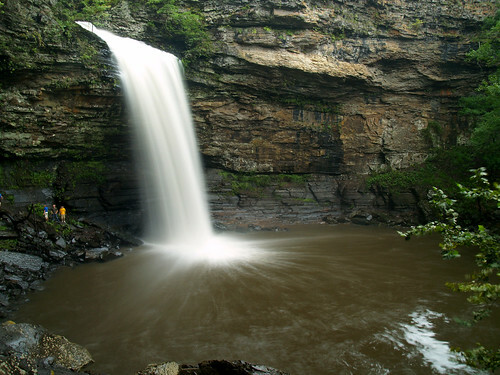 But we almost never have waterfalls this time of the year in Arkansas. Usually summers are dry here, and any rain is quickly soaked up by all of the vegetation. 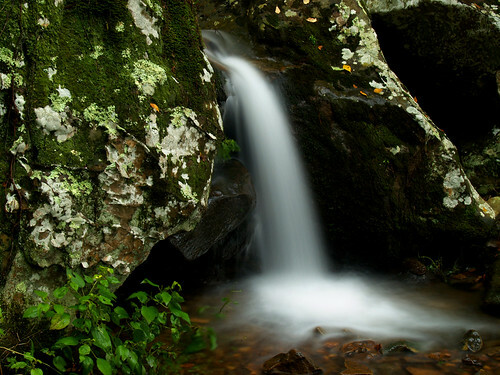 The only time we've had waterfalls this month happened was when Hurricane Gustav parked over the state last year. 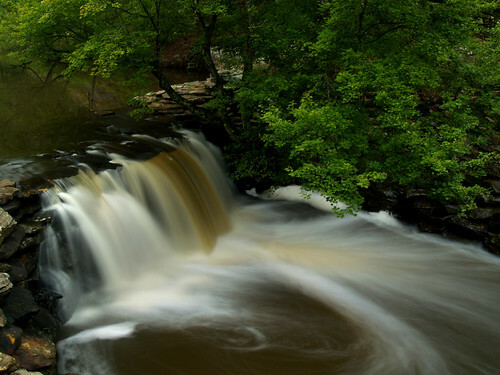 So with rivers and creeks running high, it was perfect time to get some waterfall shots. So plans were made and it was another early morning as I drove to Conway to meet Zack Andrews again. 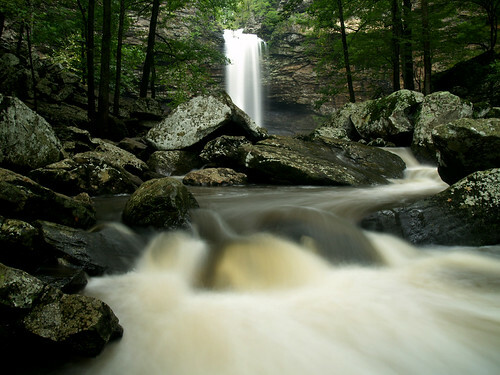 This time we went to Petit Jean Mountain, where the waterfalls were spectacular. 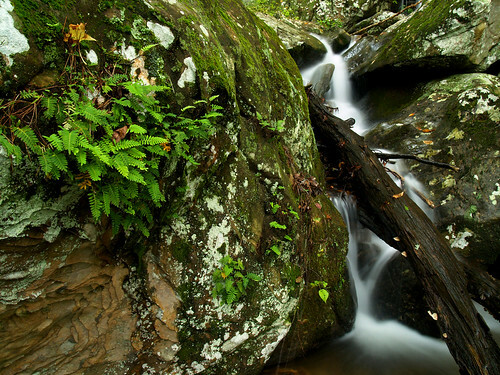 Our first stop is the small waterfall on the old rock dam that forms Lake Bailey. 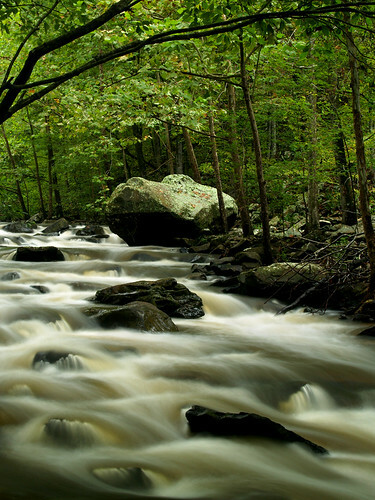 From there we went down the Boy Scout trail that follows the creek. 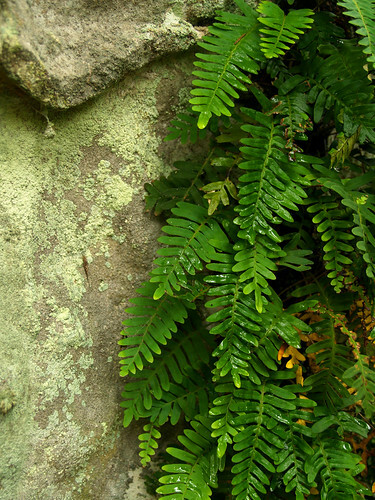 There were a few little cascades there, but my best shot was this fern growing on the side of lichen-covered rock. Regretfully, we drove away from Erbie. I’m still impressed by how cool it was, and definitely can’t wait to get back up there. Based on our short visit there, Erbie shoots up to one of my top three coolest places along the Buffalo River. 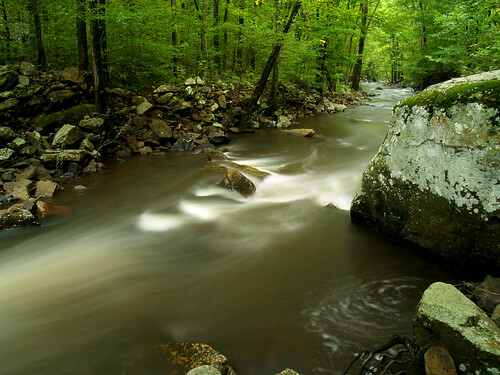 But Zack and I were heading off towards the coolest spot along the Buffalo River – Boxley Valley. 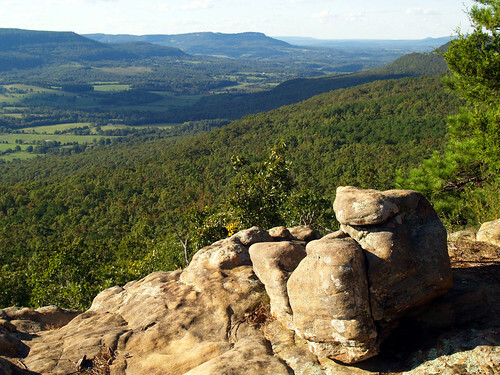 It is a great spot, with Hawksbill Crag on one end and Lost Valley on the other. 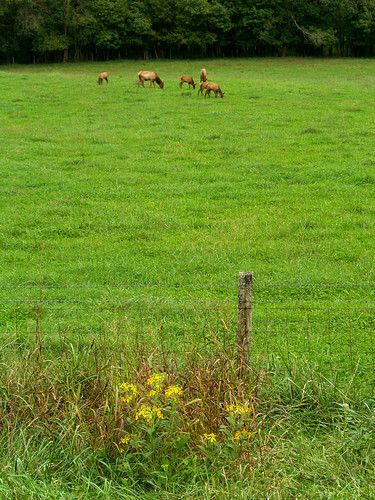 In between are a huge assortment of old barns and homes, with vast fields, swans and elk all in between. We drove through the valley, past cars parked alongside the road as their drivers sought out the elk. 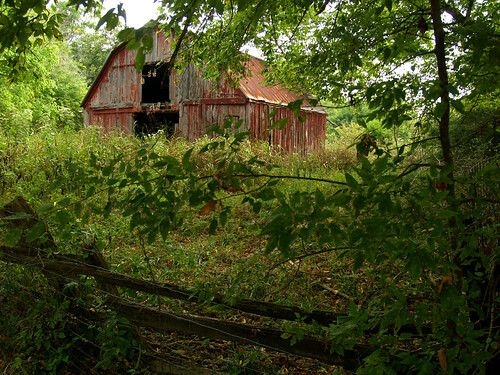 We made our first stop at this old barn, situated at the opposite end of a field. It was a bit hazy out that day, but a light fog appeared over the hills. 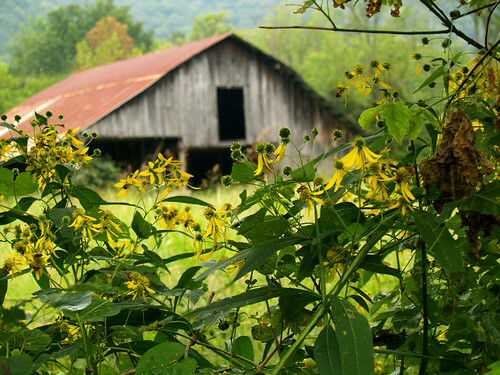 Like the rest of the Ozarks, Boxley Valley was covered with wildflowers. These flowers grew along the fence line by the side of the road. It may have been wading through the tall grass here that I ended up getting mixed up with some poison ivy. This is the view of the main road through Boxley. Traffic was light that day – most people were on the other side of the valley trying to see the elk, probably. We drove a bit further down to a small parking area that is the trailhead for the 75-mile Buffalo River Trail. There is also the remains of an old house, some sort of old cellar (I think?) 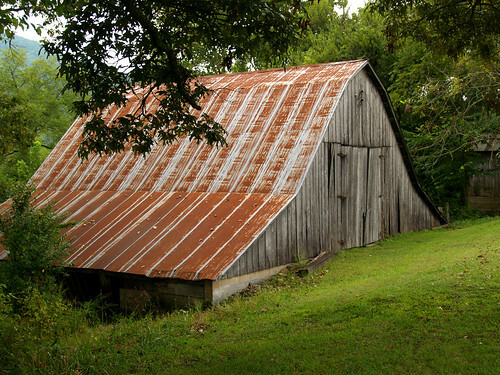 and an old barn. 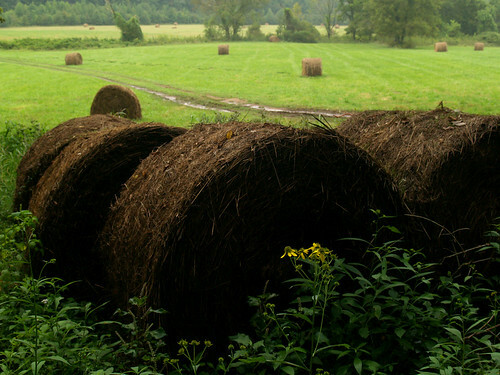 It is right next to a huge field that had some scattered hay bales laying around. 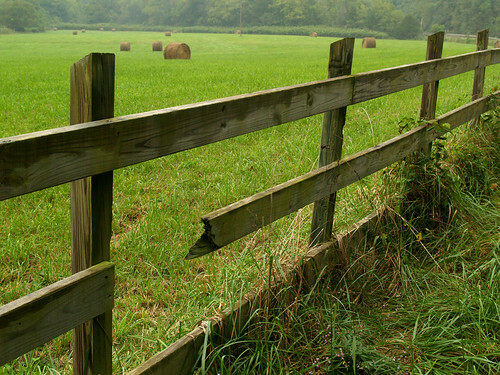 This was just further down the fence, which had a little spot of damage. 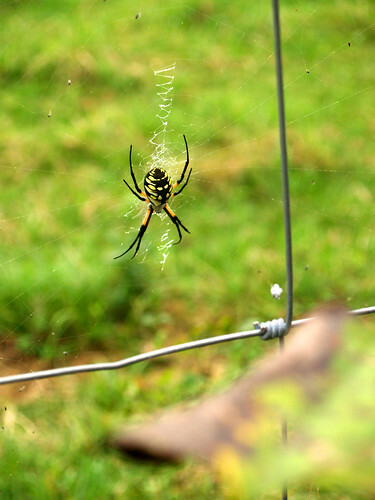 There were a lot of huge spiders out here - orb weaver spiders had set up webs all along the fence. When I first saw one, I said something like “Woah that spider is huge.” And then Zack said, “yeah, and so is the one right over your head.” I might have made a little girlie scream after that. We drove further down to the old Boxley Valley Baptist Church and walked around the historic church and cemetery. 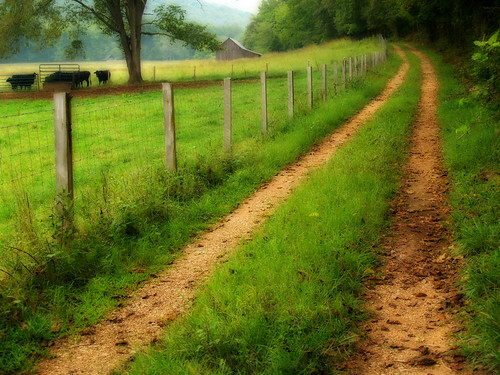 There is a dirt road that runs off past the church, further back into a field at the far end of the valley. “Where do you think that goes?” we wondered, so we took the Vibe down it as far as we could. Which wasn’t far, there was a sign saying that we were entering private property. 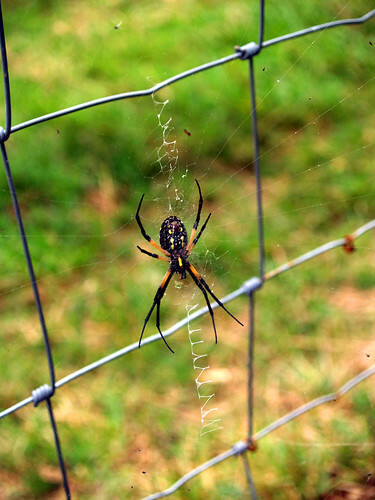 But there were several large orb weaver spiders here as well, all of the lined up nearly side by side along the fence. They might have been guard-spiders, making sure that we didn’t trespass too far. I wanted to see where that road went, but I just settled on getting this shot of the road curving away past a distant barn and out of sight. 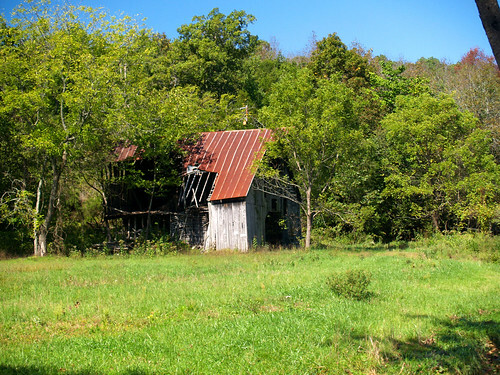 And one of the old barns – it’s amazing at how many different types of barns there are in Boxley. I like this one because it looks like it was built into the side of the hill. We drove further on, hoping to see the trumpeter swans in the Mill Pond. They were there, but sitting on the far shore next to some tall grass. We couldn’t really see them from the road. But we stopped at an old house by the pond, and went around to see if the swans were visible. They were, but I was more interested in this barn. I was taking pictures for a few minutes before realizing that the flowers were covered with some sort of bug, which I thought were bees. I’m happy they didn’t seem to mind me standing there. 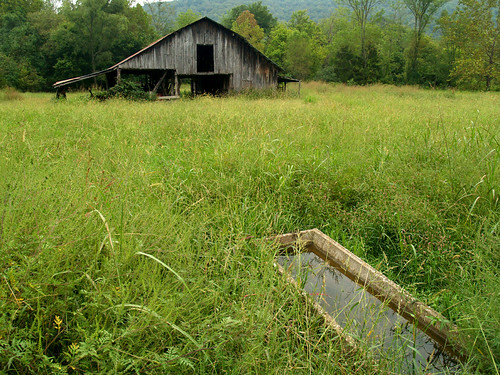 The area around the barn is overgrown, with thick grass covering and obscuring everything except for this solitary old cattle trough. 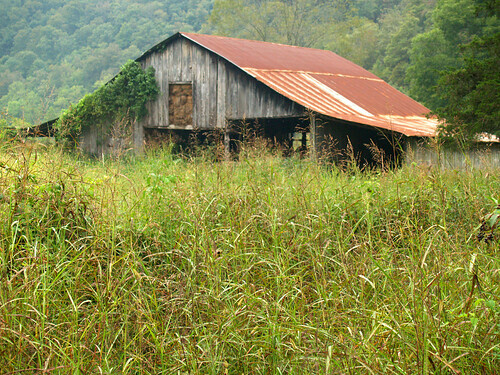 And the back side of the barn, which from here looks like it’s packed with hay. From here we drove over to the Beechwood Church and Cemetery, a little hidden spot that sits right off of the road to Lost Valley. This is a neat place, but there seemed to be something going on at the church when we pulled up to take pictures. Not meaning to bother anyone there, we went out to take some pictures. 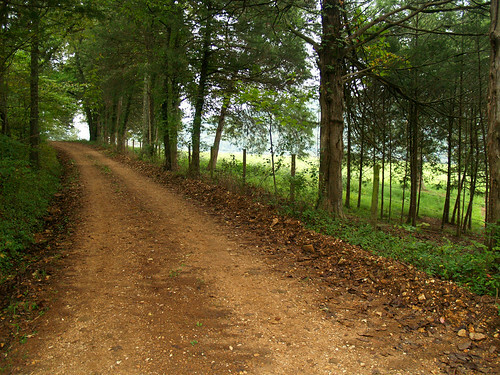 This is the dirt road that leads up to the church. The church and cemetery overlook a large field, which was beginning to get a tiny tinge of fog drifting about. And another neat barn, which was one of our last stops. With full stomachs we drove north from Jasper, turning off onto the dirt road that leads to the Erbie put-in at the Buffalo National River. I had never been through Erbie before, so I wasn’t sure what to expect. But we were off to find a waterfall, in the slim chance that it would actually be running. Luckily the dirt road was in good shape, and no damage was made to the new car (besides getting it dusty). 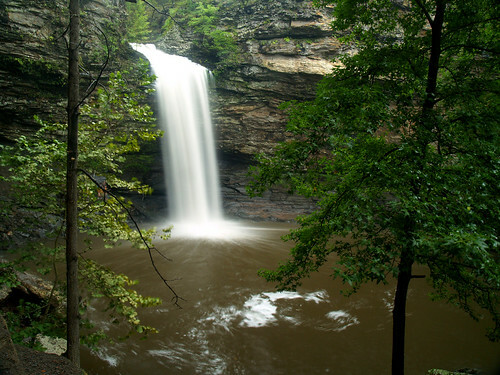 The waterfall we were searching for was Liles Falls. It’s located just a short hike from the road, so we parked and bushwhacked our way past the small creek that makes the falls. The creek had just a tiny bit of water in it, and after a few minutes we finally made it to the falls. There was some water, a tiny trickle tumbling down over the bluff. It was an impressive area though, it would surely be awesome when there is water flowing through. We filed it away for a future visit, and walked back to the car. We drove further down the dirt road, going deeper into the woods. We stopped at this one neat old barn, tucked away in the trees. Back on the dirt road, we saw a sign for a “Historic Area.” Hmmm, what could that be? So we followed the dirt road further along, finally reaching an awesome spot. 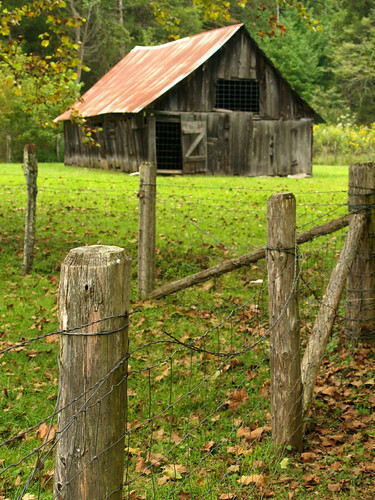 It was the Parker-Hickman Farmstead (of course a place in the Ozarks would be called Hickman). 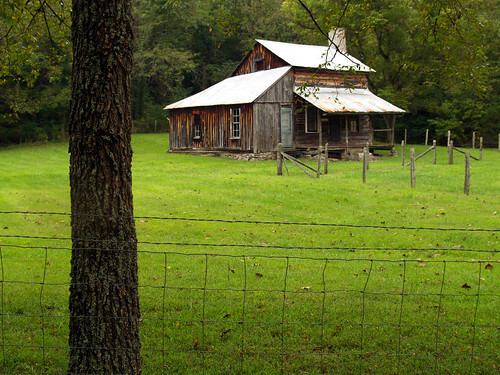 The farmstead is a collection old buildings, including a well-preserved two story house, several barns and even an outhouse. 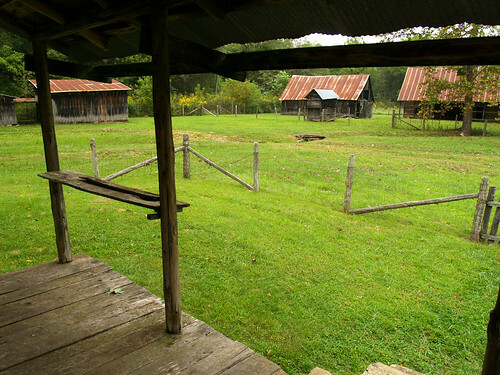 This is the view from beside the largest of the barns, looking back over at the farmhouse. Man, it was awesome! 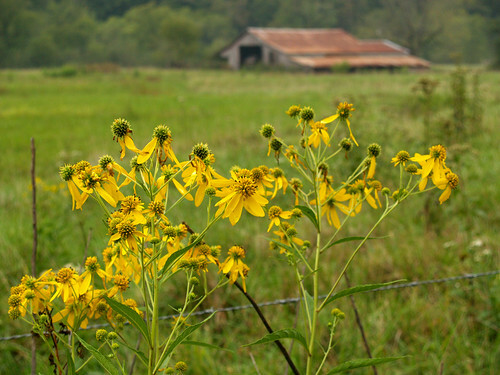 In the woods next to the buildings were tons of wildflowers, spilling out through the old fence line. 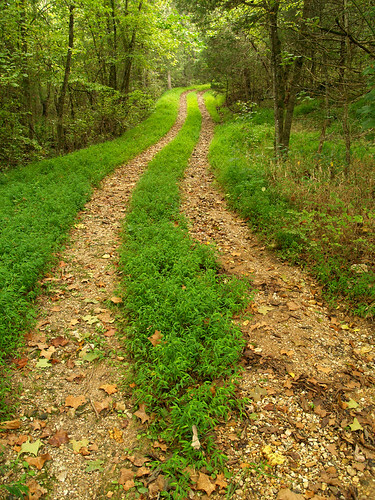 An old road took off from the farmstead, heading into the deep woods beyond. A sign said that it led to a cemetery. We nearly went down there, but it would have been a 2 mile hike there and back, so we left that for another day. 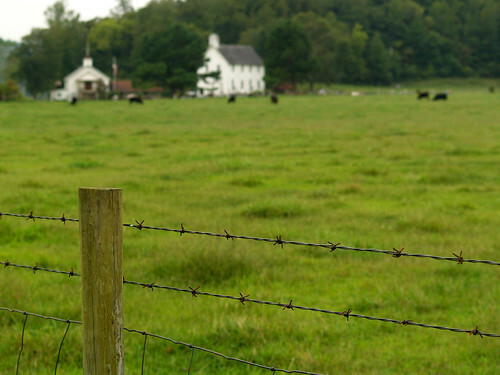 Anyways, we had more places to explore at the farmstead. The old house is well-kept and in good shape. People lived here until as late as 1978. 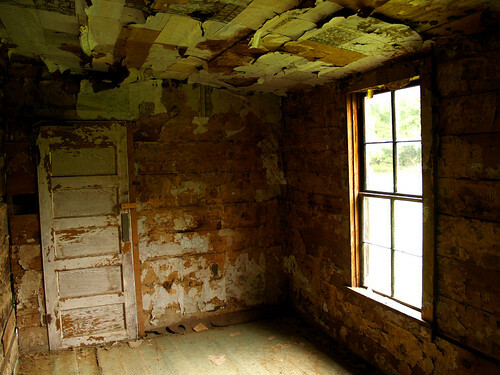 While not the fanciest house around, it’s easy to see why people would want to live there. 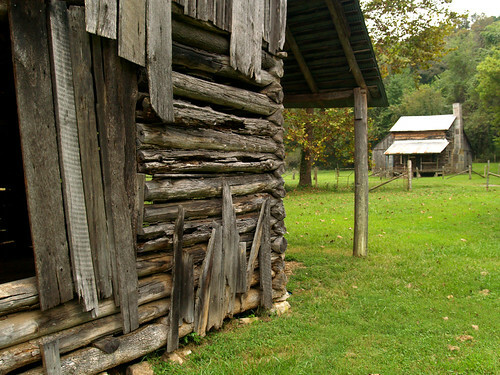 The National Park Service says that "the Parker-Hickman home is one of the oldest structures standing in the Buffalo National River. In the late 1830s, Alvin Parker and his brother Greenberry arrived from Tennessee and built a home here using the nearby red cedar trees. Joining the hand-hewed logs with half dovetail notches, the Parkers crafted one of the finest log houses in the Buffalo River valley." "Over the years, later owners built additions to the original log house. The last owners - the J.D. 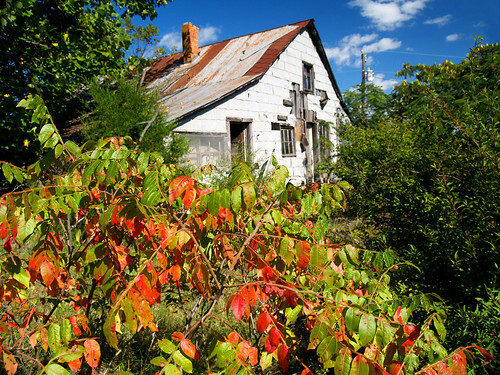 Hickman family occupied this farm from 1912 to 1978 and constructed most of the outbuildings visible today." This is the view from the front porch. Looks pretty relaxing, right? It makes me want to get a beer and a rocking chair and sit for a few hours enjoying the view. The front porch was a lot better than the back porch too, which had a hornet’s nest. The Park Service lets you go inside the building and look around. It’s really cool, though somewhat creepy. In one room, you could see layers of old newspapers, magazines and wallpapers that are peeling back from the walls and ceiling. Back in the olden days, papers like this were stuck on the wall as a form of insulation. In this room you can examine the layers here, like an archaeologist. The top layers look like modern wallpaper, but further and further down you go it reaches the old magazines and newspapers. 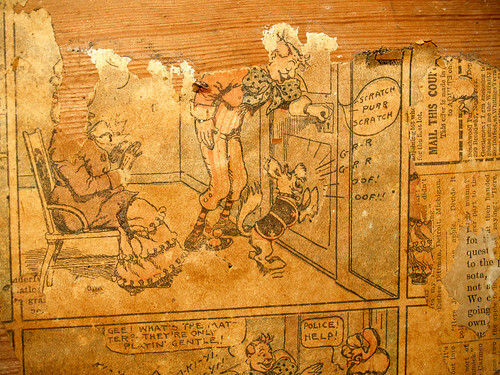 Here is part of an old comic strip, hanging up on the wall. I wish I had more of the comic strip, since I'm interested to see what happens next. Why did they need the police? I thought it was pretty cool - one of most intriguing comic strips I've seen lately (well except for Garfield Minus Garfield). We searched for a date on one of the papers, but couldn’t find one. And one more. This is a beautiful place, hopefully we can go back when the trees are changing color. The dirt road went a bit further, heading right up to the Buffalo River. 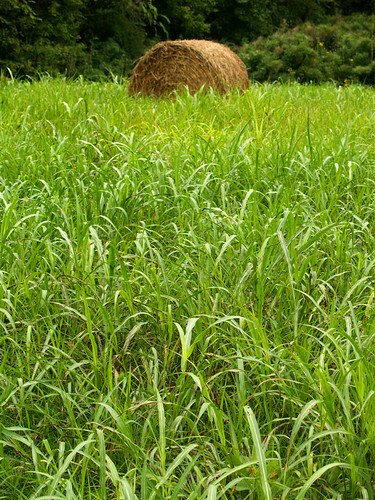 We went out to take a few shots, including this one of a hay bale nearly lost in some tall grass. After that we drove back the way we came, eventually heading back onto Hwy. 7. 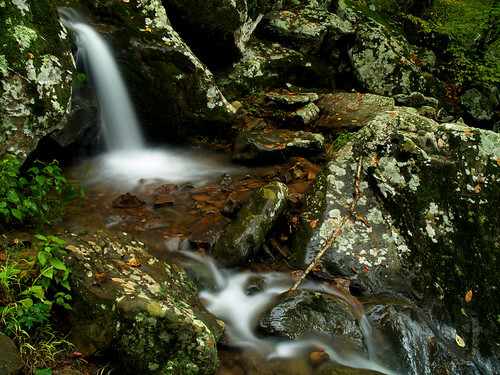 From there we decided to make a quick stop at another awesome spot along the Buffalo River – Boxley Valley.